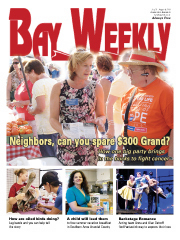 As Bay Weekly  which is also the name of the Albin 28 in which husband Bill Lambrecht and I fish and cruise  passed under the Choptank River Bridge and through the extended arms of the Bill Burton Fishing Piers, we saluted the Old Man of the Bay. But salty stories in his honor were interrupted by the shriek of an engine alarm. A clogged fuel filter sent us back to Cambridge. Clearly, Bill Burton wanted to keep us around. Since Bill Burton’s death at 82 last August 10, I encounter him in many places in Chesapeake Country, not the least of them in my heart. I can bump into him at Chevy’s Fresh Mex, where he loved a burrito. He’s an arm’s length away, still speaking to me through the receiver of my phone, as he did every Tuesday for 17 years. Eat a peach and I think of him, for my last visit with him was to deliver Bay Gardener Frank Gouin’s August peaches. Harrison’s Chesapeake House on Tilghman Island  the home of his annual fishing trips  is as thick with him as it once was with the tobacco smoke of his pipe. But two fishing piers are the spots that bear his name. One, at Fort Smallwood Park in Bill’s Northern Anne Arundel County neighborhood, was dedicated to him last September, in honor of his work on the planning committee that transformed the long-neglected park. The other, where he stopped us on the Choptank, was dedicated July 23, bringing cheers and tears to a sweltering gathering of family and friends. Piers were dear to Burton’s heart. He believed that fishing was good for people, retuning them to nature’s rhythm  though he never put it quite that way. He believed that you shouldn’t need a boat to catch a fish. Or to have, as he did, friends eager to take you fishing on their boats. He believed you ought to be able to get to the water. It angered him that in the land of water so many would-be fishers were left high and dry. So when the old Choptank River Bridge was replaced back in the late 1980s, Burton lobbied to keep it as a fishing pier. Then outdoors editor for the Baltimore Evening Sun, Burton hit the issue hard in his columns. He twisted arms of his friends at Maryland Department of Natural Resources, and he put his persuasive skills to work on politicians. Piers are still rare. Gary counted them for me. “I’m literally going around the Bay,” he said of his enumeration, “and you can count on one hand. As the younger among his family and friends proved that dedication day, hooking six spot, a bluefish and a toadfish from a shady shelter on the pier near the center of the wide Choptank. 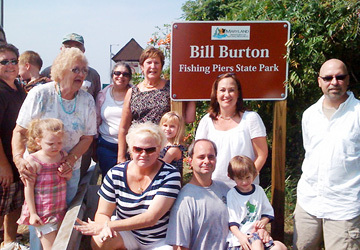 The Bill Burton Fishing Pier State Park is open 365 days a year, 24 hours a day. Both Talbot and Dorchester County sections have been upgraded with new concrete rails, park benches and picnic tables. Both are lighted for night fishing from April 1 through December 3. The Dorchester County side is lighted year round.